I baked up a sweet combo dessert. I used Pillsbury Strawberry Moist Supreme cake mix with Vanilla icing. First, I baked the mix into mini-cupcake shapes. To make a mini-cake I used a small cooking pot! This cake mix actually comes with pudding in it, so I must say it was very thick. Once the cakes cooled off, I iced them with the Vanilla icing. In the meanwhile, I put aside any cupcakes that did not hold a full shape or that got messed up when I was taking them out of the baking pan. Once iced, I took the leftover cake and moved the pieces between my fingers to create crumbs. 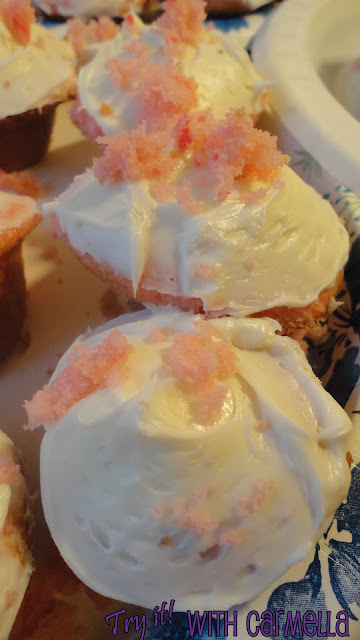 Then, I sprinkled the crumbs over top the cake and cupcakes for a cute pink decoration! I added Strawberry Twizzler's strings on top of a few of the cupcakes. Sooo good! Loved the strawberry taste. I recommend this combo of baking products for sure!